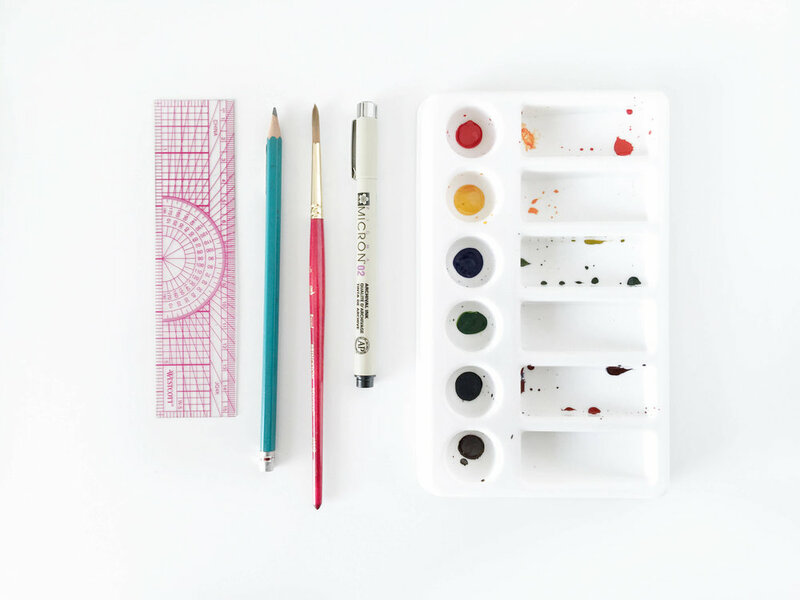 Last week, I started a blog post series about 5 different types of watercolor charts beginning with the basic watercolor chart. Like I mentioned, not all of these will technically be charts - today we're reviewing a type of scale. But whether they are charts or scales, I like to think of them all as part of the same family of exercises that help me understand the colors I'm working with better. The term value, in art, is the lightness or darkness of tones or colors. On a gray scale, for example, black is the darkest value and white is the lightest value. The easiest way to experiment and see different values for any color is to paint a basic 5 point value scale. (If you’re curious what it is in numbers: 1 is the darkest and 5 is the lightest). Of course there are many other gradients that can be made, but I think 5 steps is adequate enough for me to get an understanding of the range of values a color can produce. We define forms by showing differences in values. As an example, if you were painting a real life scene: where objects are in the light, the values are lighter, where objects are in shadow, the values are darker. Even in an abstract painting without light and shadow, a lemon yellow has a lighter value than a dark navy. The contrast between values is what shapes the forms and create interesting moments in our work. Since the easiest way to perceive values is in a grey scale, I would suggest creating a value scale using black or a dark grey first. On the example above I used Paynes Grey to paint a reference value scale first, and then painted another value scale using Phthalo Green below it. On the line below, draw 5 more squares or rectangles aligned underneath (mine are 1/2” x 1”). If you want to test out multiple values for different colors, just keep adding lines of squares! Starting with the top line using black or grey, paint a dark swatch in the first box. You’ll want to load your brush up with a little water and a lot more pigment although it shouldn’t feel like you’re painting with paste-y paint. After all, we’re painting with watercolors, right? After you’re done with the first box, lightly dip the tip of your brush in clean water, wipe it on the edge of your water container so its not dripping wet and paint the second box. Your second box should be lighter than the first. Repeat step 4. Your third box should be lighter than the second. Repeat step 4. Your fourth box should be lighter than the third. Repeat step 6... You get the idea right? Your last box should be almost white with just a little bit of color. That's it! Now just repeat steps 3-7 with any of the other colors you want to explore values with! The beautiful thing about watercolors is that within one color, you can create many other colors just by exploring its values. It is also a great demonstration of why, when painting with watercolors, you don’t really need to use white. The more water you add, the more you allow the white of the paper to show through, and the lighter your colors become. If you're feeling like creating a library of value scale swatches, below is an idea of how you could make some single color value strips to keep around for reference! Sometimes I think painting with one color is more fun because you aren't worrying about changing colors and spend time experimenting with values instead. I hope you give this a try and maybe even paint something using only one color (monochromatic) just to experiment. Next week I’ll post watercolor chart type 3! If you’ve been following along and found this helpful, let me know by liking this post or commenting below with any questions or suggestions for other things you’d like to see in the future! If you liked this post, subscribe to my email list to be updated with the latest here on the blog. I also send out tips, lessons learned and other useful information to subscribers that I don’t always post here!